Around 2 am we both wake up to the sound of the flapping tent and the sensation of gritty sand hitting our faces. It had been breezy the evening before but the winds had picked up, and with no contours to halt their progress, were sweeping across the sand. Really wind? There’s not much you can do in this situation except cover your face and hope sleep will get you through the many hours left before daylight. Unfortunately, this became harder and harder as the wind ripped out each tent stake one by one, leaving every corner loose and trying it’s best to fly away. Only the weight of our bodies and backpacks kept the tent on the ground, and all the loose fabric billowed around us, throwing sand into our faces and making it difficult to breathe. We kept waiting for the tent poles to break and the whole thing to collapse around us. Time barely moves as you shift through the cycle of waking up, looking around, readjusting, drifting back asleep, then waking up again. The lights from town were bright enough that it regularly looked like dawn from inside the tent, and the disappointment of discovering that we still had hours left was crushing. At the first hint of light, we were up and packing. 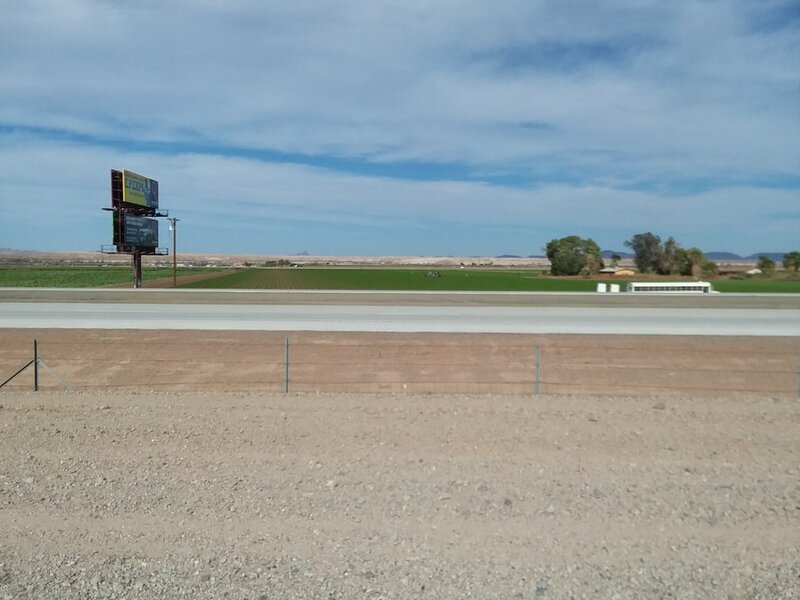 We had camped just outside of a Cocopah reservation and we could see a casino just a couple miles away. Casinos mean bathrooms and breakfast so we beelined at our fastest speed. Upon arrival we headed straight for the restrooms to try to neaten our bedraggled appearances. There’s not much you can do with your one grimy outfit that hasn’t been washed in weeks, but you can splash some water around and try to cover your knotted mass of hair. The casino was exclusively filled with folks of the blue-haired variety and we did not fit in. Oh well. We slunk around the noisy slot machines and found a quiet booth where we could order plenty of coffee and breakfast fixings. Upon eating our fill (and then some) and endlessly procrastinating on our final miles into town, we began the trudge. Back to I-8 and traffic hell, but with one added benefit, the Colorado River! We were looking forward to intersecting it’s path on this trip since we know the Colorado well. Back in Colorado where we’ve both been living for the last couple years, the same river flows fast and wide, with a horde of people enjoying its legendary rapids and fishing holes. This, however, barely felt like the same river. The banks were crowded with tamarisk and cane and we could only glimpse it’s waters. What we could see was shallow and stagnant. Already so much of its water is depleted and it hasn’t even reached the Imperial Valley, where three out of every four drops of the remaining water will be diverted into the All-American Canal. There is so little water left by the time the Colorado crosses the border that this precious river no longer reaches the sea. Even with its depleted water, the Colorado is too big to cross on foot so we had to make our way to the same bridge that every one of the cars barreling down I-8 was also headed for. Ugh. To our right the thick mat of green vegetation bordering the river towered over us, shielding the river from view and forcing us to walk right next to the interstate. To our left and across the highway were more crop fields and we looked (unsuccessfully) for our friends from our bus hitch a couple days back. We saw many other laborers though with similar buses parked beside them, often with Portapoties on a trailer that they drag behind them to and from the worksite each day. The workers toiled behind massive billboards that lined the highway, advertising the upcoming attractions of Chick-fil-A, IHOP, Paradise Casino, etc. We escaped the highway only once, taking a side road through RV land. We skirted row after row of RV campsites, each one furnished with a gravel pad, a hook up and one tree. Welcome to Yuma. Apparently it's the place to be for snowbirds; people who flock to the desert during the winter months to avoid colder temps up north. The area doubles or even triples in size as these folks descend and entire suburbs fill up and then empty with their movements. A different kind of migration than what we’ve encountered so far! We had to reroute when we made it to the bridge, realizing that we wouldn’t be able to safely cross such a busy, massive and elevated structure. Navigation on this trip is not just a matter of compass and maps but also figuring out what places pedestrians can and cannot cross. We moved east to another road with a smaller bridge hoping we could dash across. The crossing was one of those great, old-fashioned steel and cable suspension bridges and it actually had a pedestrian walkway on both sides. We crossed the Colorado River in style, as a train rumbled alongside us. The river is also an important landmark to the project, as the river signaled the end to California and the beginning of a new state, Arizona. One state down, three to go! After a couple more hours of walking through Yuma’s streets, we made it to the hotel. As usual, town feels good. There’s a Dairy Queen right across the street and we stop by, feeling nostalgic about a section of the Appalachian Trail that we got through only by eating a Blizzard a day. We have a day off scheduled for tomorrow and we hope to get a bunch done before we enter the very intimidating Sonoran Desert.